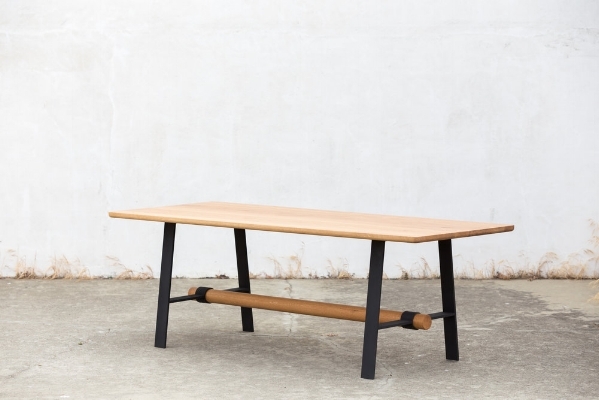 Form + Field loves to commission the work of local craftsmen for our custom projects. When it comes to millwork for wood furniture, we particularly love the creations of Four/Quarter. 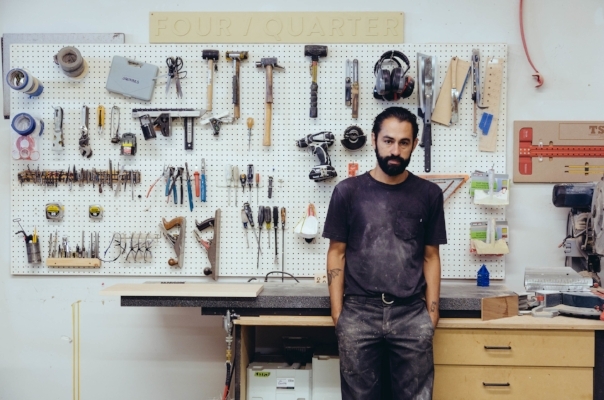 Four/Quarter is a San Francisco-based studio and the brainchild of designers Sergio Traverso and Kenny Johnson. Though Sergio has since assumed sole ownership of the company, his team’s designs still preserve the original vision: clean lines, a modern feel, and natural treatments of walnut, oak, ash, and douglas fir — a perfect style fit for Form + Field! Case in point: Four/Quarter recently completed this sleek, Donald Judd-inspired piece for the bar area of our Lacquerbar project. 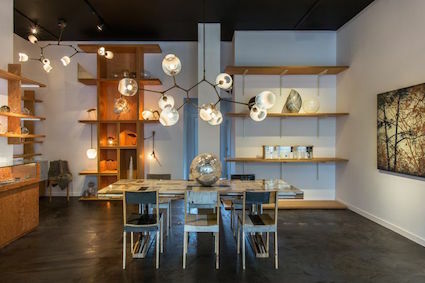 Some of Four/Quarter’s other notable works include Amour Vert in Palo Alto, California, Little Gem in the Hayes Valley neighborhood of San Francisco, and a work-in-progress custom cabinet for our Mission Bay Penthouse project. We checked back in with Sergio this month to ask some thoughtful questions and go inside the mind of one of our favorite craftsmen. Q: If you were a piece of furniture what would you be? Q: Which living person do you most admire and why? A: I've always admired the work of Jasper Morrison. I love the idea of designing beautiful products intended for mass-manufacturing. His products are informed by logic and available technology but have handcrafted beauty. Q: If you weren’t a designer and craftsman, what would you be? A: Probably a motorcycle mechanic or a dog walker. Q: Which book or film has changed your way of thinking? A: Jiro Dreams of Sushi. His dedication to his craft is absolutely incredible. 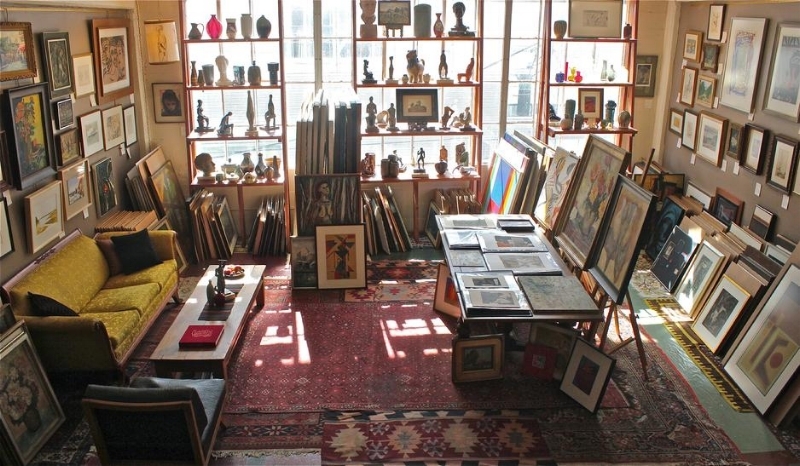 Q: What is the most treasured object in your own home? A: A big beautiful hardbound copy of Hans Wenger's Bauhaus. Q: What are your aspirations for the next 3-5 years? A: I’d like to move away from custom work and continue expanding the Four/Quarter furniture line. Q: What motto do you try to live by? A: Measure twice. Cut once. That’s advice we can get behind! See more of Four/Quarter’s work. When it comes to renovations, the Bay Area is a unique place. 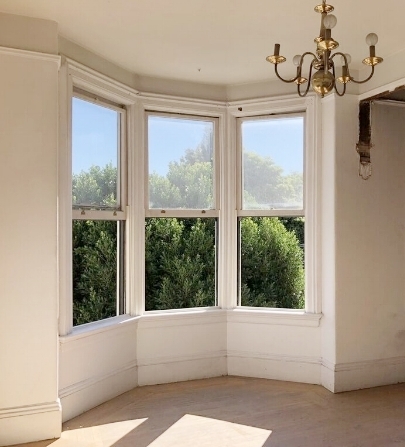 Between historical preservation, city planning commissions, and keeping the peace with your not-so-distant neighbors, building in the city and surrounding areas isn’t a stroll through Golden Gate Park! If you’re looking for someone to consider your space’s flow, daily function, style, finishes, furnishings, accessories, and art, you’ll want an interior designer on your team. Structural engineers and architects have their specific roles, and won't be able to get into the nitty gritty of interiors work. Interior designers are immersed in the latest designs, materials, and vendors for the items that go into your space, especially when it comes down to specific functional needs such as the latest in kid- and pet-friendly materials. Tip: Assembling a reno team takes time, so start looking at least 1-2 months in advance before you want to start the design process. Consider the scope of your work and whether you simply want the architecture of the space done, or whether you want all the details completed down to the furnishing, art, and accessories. Bay Area renovations range from a minimum of $300-$500 per sq ft, depending on the room, the finishes selected, and the amount of construction required (addition, rerouting pipes, windows, etc.). To be safe, err high, and always have a contingency budget of at least 10% for unforeseen expenses. There may be surprises hiding behind those walls, or you may want to increase the scope along the way. If your budget doesn't cover your ideal scope, try to prioritize your wish list into phases that optimize the time and money to be spent. For example, if you're changing the flooring in a room, then consider if you should do painting at the same time so that the room can be efficiently completed. The current Bay Area building boom means your project may not begin right away. If you’re doing an extensive renovation, permits from your city can also take additional time, sometimes as long as 6-12 months or more, due to the back-up of requests. Plus, the high demand for construction means that labor costs are increasing year over year in the double digits, so it’s important to lock down a contractor sooner rather than later. Contractors will line up other work for when they predict your project will end, and if there’s scope creep later during construction, there’s no guarantee your project will be completed by the same contractor... or in a timely manner. The Solution: Assemble your team well in advance and clearly define scope based on your budget before construction starts. As interior designers who have been through the renovation process end-to-end, Form + Field is your partner and advocate throughout the entire journey and beyond. Have additional tips to share for renovation projects? Add them to the comments below! Before you're in the midst of your project and wishing the nightmare would end (believe us, this happens more often than not), check out our advice on what you can proactively do to set yourself up for success. Here's Part 1 of this two part series. If you’re doing any kind of exterior renovation in the Bay Area, you may be required to keep your new exterior design cohesive with the neighborhood. For example, if you’re on a street where every house has a bay window, your home’s exterior may need to incorporate some sort of bay window. Keeping the character of the neighborhood can also be subjective, and you’ll be at the mercy of whatever planner the city has assigned you. For any renovation affecting the exterior, it’s best to have an architect on your team. Architects are great for thinking about the exterior and spatial volumes of a building. Tip: Choose an architect who has done many projects in your city or town so they know the planning department well and have their ear. Also, learn in advance from the city's planning department or the architect what the standards are, if any, for keeping the neighborhood character. That sleek, modern addition of your dreams may not be 100% attainable! On the subject of neighborhoods, the Bay Area, and especially San Francisco, is unique in that just because you own your property, it doesn't mean you have complete control over what you do with it. However, it's not just the planning department that has a say, but also your neighbors. In the case of exterior changes, consider your neighbor your best ally, or potentially your worst nightmare. The planning department doesn't want a neighbor's complaint to go into official review, so you're incentivized to resolve differences with your neighbors early without getting the planning department involved. Meet your neighbors face-to-face and get to know them before you start your renovation process. Listen to their concerns about your plans, and work together on creative solutions. Sometimes you won't be able to placate your neighbors 100%, but it helps to show that you tried. If you haven't tried, the penalties can be severe, and a big red pen might be taken to your design. Open floor plans are one of the most popular renovation requests right now — but not all of those walls can be simply knocked down! Sometimes there’s plumbing behind the drywall or it's a load bearing wall. 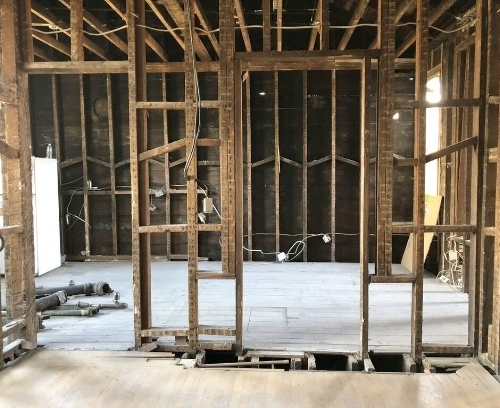 Pipes may or may not be worth relocating, and to remove a load bearing wall, you may need a new steel or reinforced beam to carry the weight of the floor above. If you’re determined to make an open concept plan happen, hire a structural engineer. They’ll come up with a construction design that will give you the space you want while adhering to building code and safety. Even if you have an architect on your team, the architect will likely still recommend hiring a structural engineer if there’s significant work needed. On the other hand, if it’s simply removing a few walls and not an addition, you might be able to get away with only a structural engineer and interior designer on your team, and no architect. We'll be concluding our two-part series of renovation tips for the San Francisco Bay Area next week! Stay tuned. 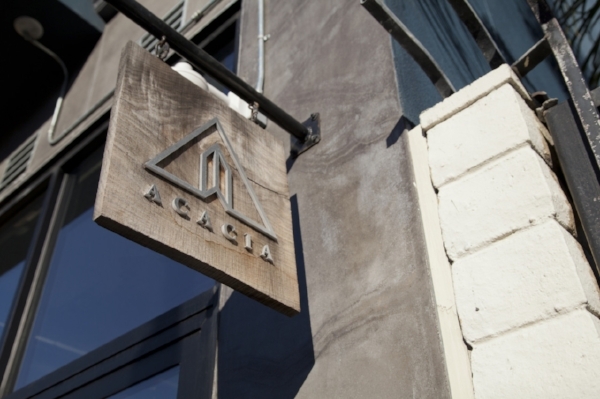 The Future Perfect at 3085 Sacramento St.
ACACIA at 415 Valencia St.
STUFF at 150 Valencia St.
Lost Art Salon at 245 S. Van Ness Ave.
Tell us! 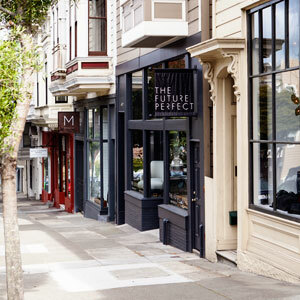 What design shops do you love in SF? The main workspace is screened from the dining area. Bay Labs is a start-up that will change the world. Using artificial intelligence to solve problems in healthcare, they are developing breakthroughs in cardiovascular imaging to combat heart disease, the leading cause of death worldwide. 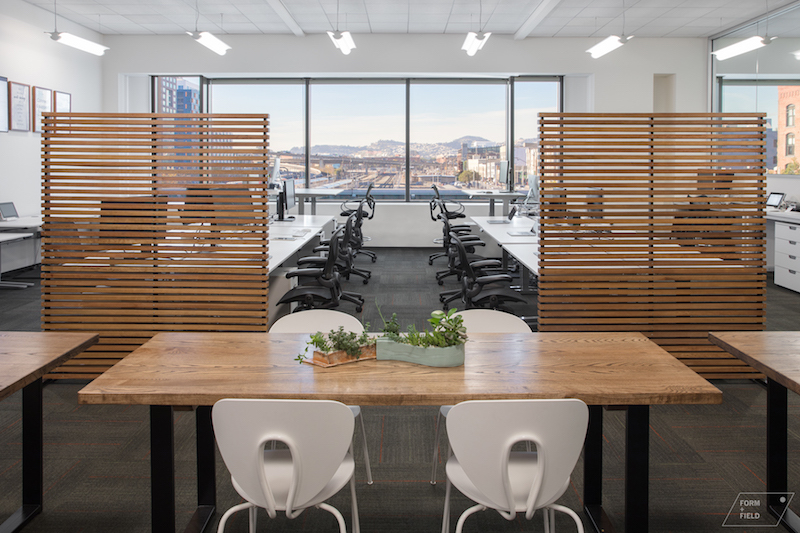 Last April, Bay Labs approached Form + Field to design their new San Francisco headquarters in the bustling SOMA neighborhood. 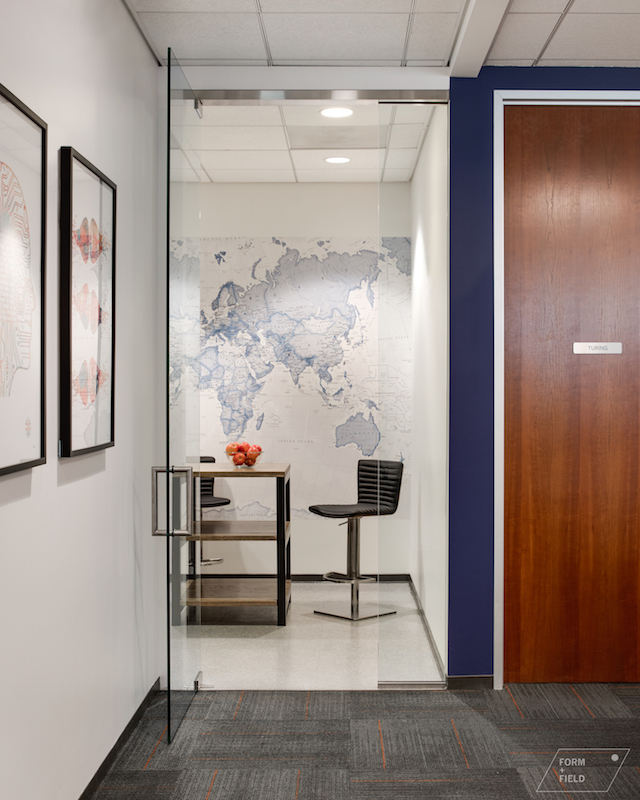 Collaborating closely with the co-founders, we created an office space that encapsulates the Bay Labs brand. The space is welcoming for the start-up's many collaborators and investors, and strikes the perfect balance between comfortable and professional. Sound was a large consideration in the design, and new glass doors were installed to separate the kitchen area from the main open office space. A "telephone booth" was also constructed on-site to provide a dedicated space for phone calls and private conversations. 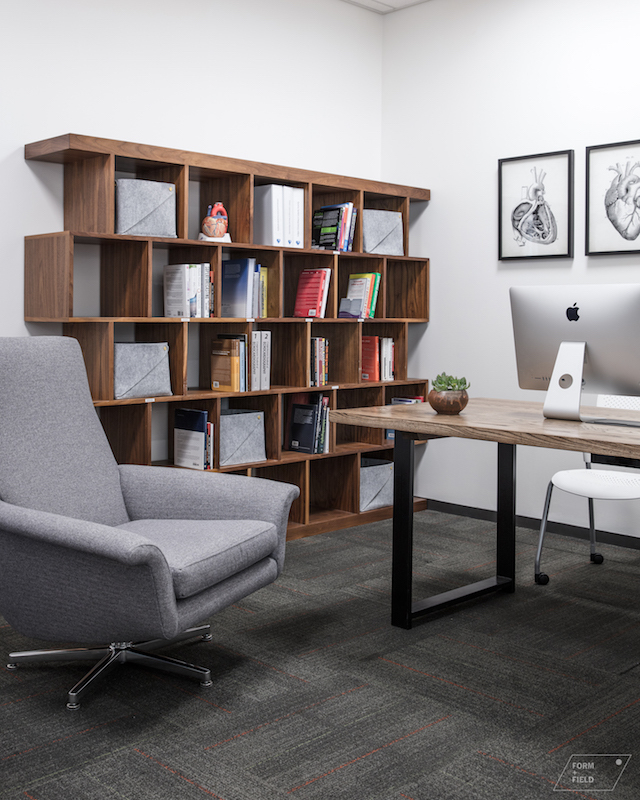 Scroll down for more photos of Bay Labs' San Francisco office! Have an office project of your own? Schedule a consultation with us! The windowless reception area is made welcoming through deep blue paint. New glass doors were added to block kitchen sounds from entering the work area. A cozy library is used for quiet work and research. 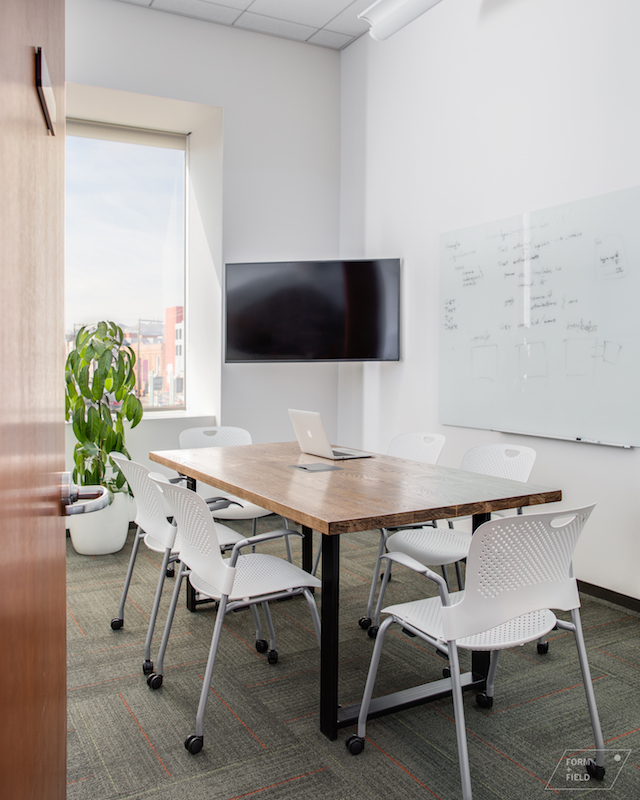 Conference rooms are outfitted with custom tables and comfortable chairs.